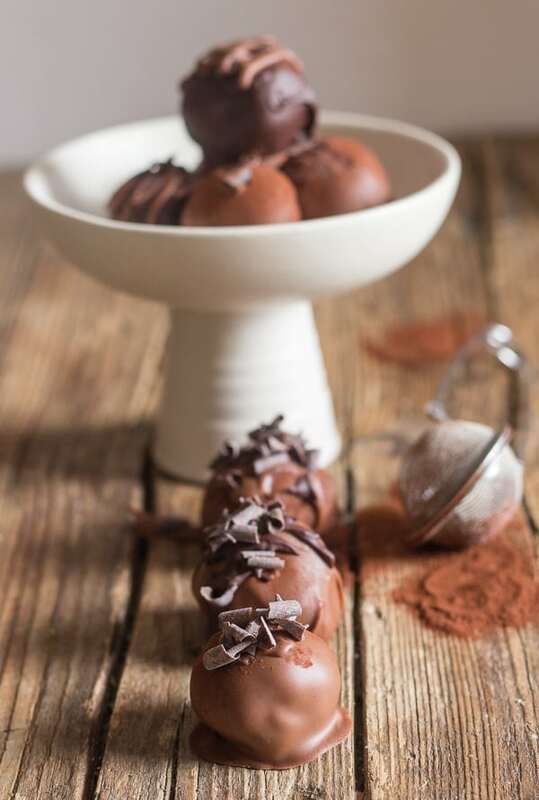 No Bake Tiramisu Truffles a delicious tiramisu filling with a milk or dark chocolate coating. 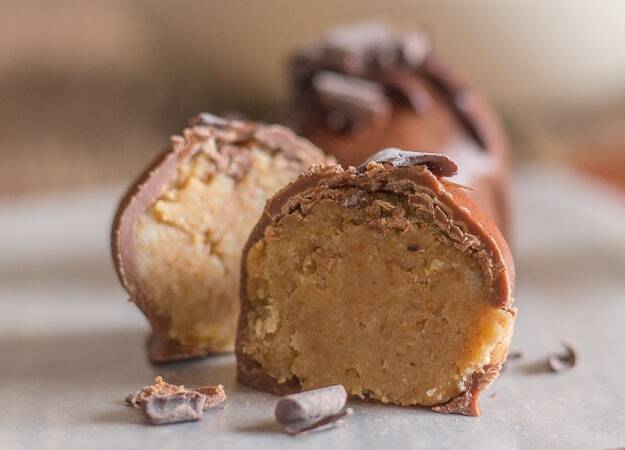 The perfect no bake Holiday treat. 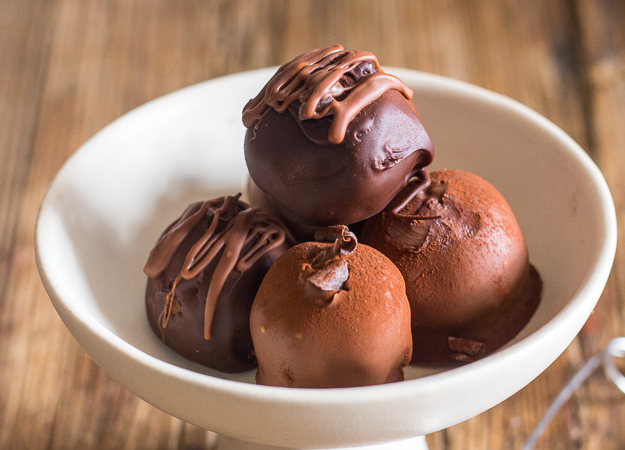 No Bake Tiramisu Truffles, our new Christmas no bake Candy recipe. 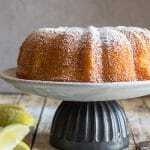 Creamy and so fast and easy to make. So as we head into Christmas count down, and I am pretty well finished with baking cookies. I decided to make some truffles. Delicious Christmas Cookies to make this Holiday Season. 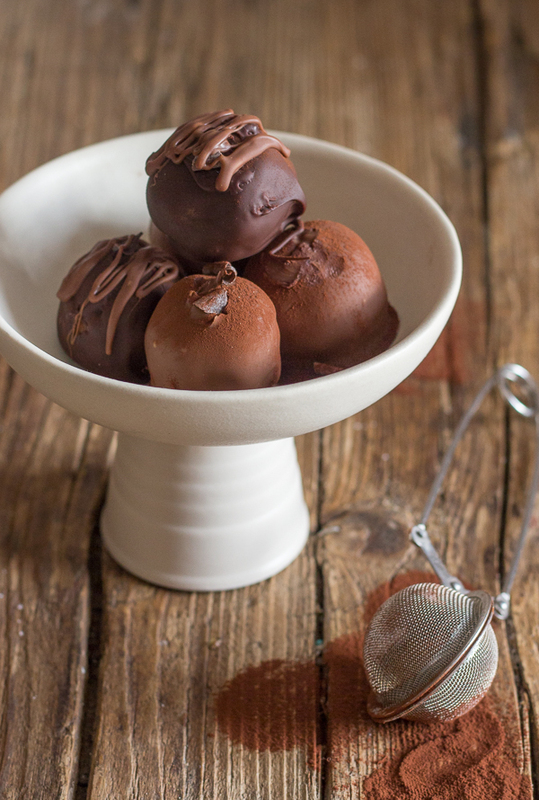 After I did a remake of my Filled Chocolates I thought these Tiramisu Truffles would be the next best thing. I love chocolate and the Italian loves anything Tiramisu. To think when I first came to Italy I had never tasted nor heard of Tiramisu, and then when my sister-in-law made it, I firmly believed that I had never eaten anything so delicious in my life. Her Tiramisu made with my mother-in-law’s Sponge Cake is one of our favourite desserts. And what’s even better about these truffles? They are no bake. 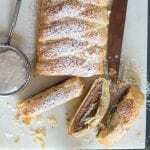 I used Savoiardi Cookies (Lady Fingers), mascarpone, strong coffee and a little cream. 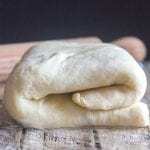 You want the dough to be easy to roll and firm and a couple of hours in the fridge is all it needs. After I rolled them into golf ball size balls I placed them in the freezer for about 15-20 minutes, that way the toothpick stays in better when dipping. I decided to dip them in some milk chocolate and also some dark chocolate, then I decorated them with some chocolate curls. And of course you can’t have Tiramisu without a sprinkle of cocoa or so says my husband! Or Christmas without Truffles. Enjoy! 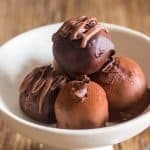 No Bake Tiramisu Truffles made with lady fingers, mascarpone, coffee and cream, then dipped in melted milk or dark chocolate. In a food processor add the Savoiardi Cookies and the sugar and pulse until completely crushed, then add the mascarpone and the cream, combine. Then add the coffee a little at a time and combine (start with 1 tablespoon if the dough sticks then leave at that). The dough will be thick. 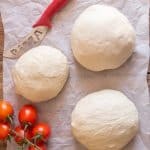 Place the dough in a glass bowl, cover with plastic and refrigerate 3-4 hours. Remove from the fridge and roll the dough into golf ball size balls (or slightly smaller if desired). Freeze for approximately 15-20 minutes. 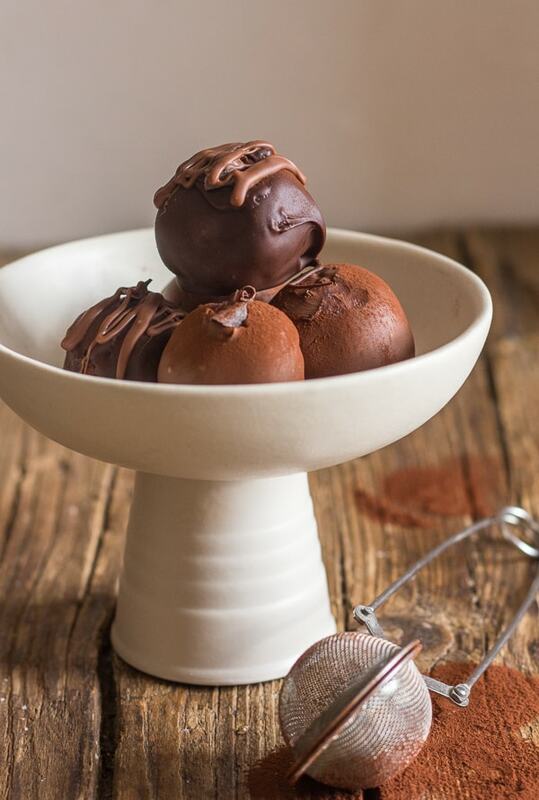 While they are in the freezer, melt the chocolate, place half the chocolate in a bowl over a pot of boiling water, stir until melted, remove from heat then add the remaining chocolate stirring until smooth, let cool slightly. 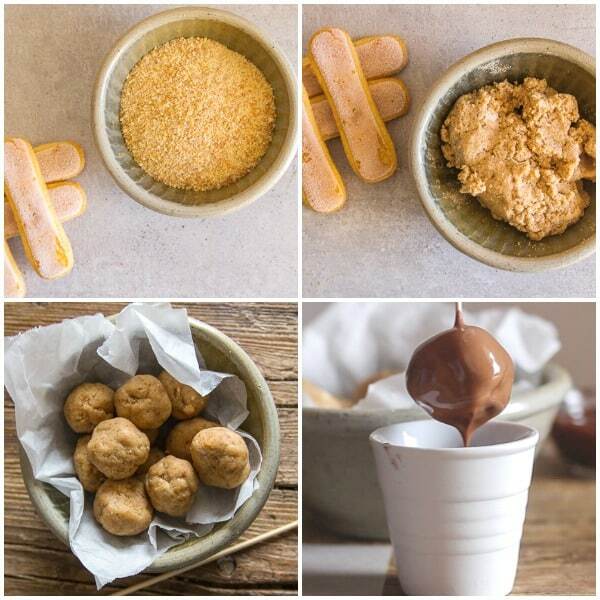 Remove from the freezer, place a toothpick in every ball and dip into the melted chocolate, place on a parchment paper lined cookie sheet with the toothpick still attached. While the chocolate is still wet, add chocolate curls. Let harden. Then dust with cocoa. Enjoy! **my house is quite cool so they became firm without the need of refrigeration. Hi Rosemary I also made these today just to try them as I couldn’t wait for a special occasion and they are to die for. My husband is the taste tester and he was absolutely blown away with them. My family comes over every Sunday and I always have a home made dessert ready so this will be part of the dessert which I am sure they will love. Hi Mil, thanks so glad they were a hit, nothing like truffles! Have a great weekend. Do you use coffee as in liquid or coffee as in coffee grounds? Hi Melissa, that would be liquid coffee. I hope you like them. Hi Natalie, thanks and they were really good. Have a great weekend.